The year 2014 represents the 50-year anniversary of the introduction of the binary system of education in Australia. Using history as a policy tool, Francesca Beddie looks back at the binary system as well as its demise with the Dawkins reforms of the late 1980s to uncover the lessons learned. Four main issues are identified as enduring problems for tertiary education: the diversity and parity of esteem between the various elements of the tertiary education sector; the pathways within education and to the labour market; the place of research in mass tertiary education; and governance and autonomy. A companion publication, What next for tertiary education? Some preliminary sketches, makes some suggestions for future tertiary education. Australia’s education system has undergone many changes over the past 50 years — and it will continue to do so as governments change. The first major reform over this period was the introduction of a binary policy of higher education, which was subsequently replaced by a unified system with the Dawkins reforms. Today, potential changes to the system include the deregulation of student fees and the widening of government-supported university places to cover provision by private providers. The latter would open up the delivery of tertiary education — taken here to mean diploma and above — to traditional vocational education and training (VET) providers to an increased extent. re-application of ideas already tested. While this particular report is contextualised through a rereading of the Martin Report (the report of the Committee on the Future of Tertiary Education in Australia, published in 1964—65), a companion piece What next for tertiary education? Some preliminary sketches (Beddie 2014) makes a number of somewhat radical suggestions for future directions to tertiary education, with the aim of stimulating discussion in this area. In the key messages that follow a set of issues for tertiary education are highlighted, issues that have continued to be problematic despite the various changes to the education system over the past 50 years. Combining general education and technical education effectively and efficiently remains a challenge for the tertiary education system. Although many different types of educational institutions currently offer tertiary education, including dual-sector, mixed-sector, TAFE (technical and further education) institutes, universities and private providers, the goal of parity remains elusive. Vocational education and training continues to be accorded a lower status, although this is partly attributable to the status of individual occupations. There needs to be recognition that, while institutions differ between those with a comprehensive research base and those whose primary focus is teaching, research should not be elevated above teaching. Both deserve similar status. Although educational institutions are subject to government regulation, they need the capacity to find their own niche in the market and have some autonomy in order to achieve diversity and excellence. Incompatibilities in curriculum, the lack of enforceable policies on credit transfer, and suspicion over the standards of TAFE colleges and other non-traditional tertiary education providers remain as persistent barriers to the easy transfer from one sector to another. From the late 1960s to 1988, Australian ‘higher’ education comprised universities and colleges of advanced education (CAEs). This binary system arose from the Menzies Government’s response to the 1964 Martin Report, which had ‘framed its recommendations with the object of widening the range of educational opportunities beyond the secondary school, of providing extensive vocational and specialised training and of ensuring that Australia makes a worthwhile contribution to the advancement of knowledge and of achievement’ (Committee on the Future of Tertiary Education in Australia 1964—65, vol.1, p.1). The system was built on the premise that higher education (sometimes interchanged with the term ‘tertiary education’ and meaning diploma and above) should be available to all citizens according to their inclination and capacity and taking into account the need to find affordable ways to meet expanded demand. Universities were deemed to have responsibilities for higher learning and research, for which they received specific funding, while the colleges of advanced education were primarily to offer vocationally oriented programs and to serve the community’s social and economic needs. By the 1980s the aspiration for a set of institutions that were equal but different was no longer able to withstand the funding squeeze and an engrained hierarchy of prestige. In 1988 the binary system was swept away by the Dawkins reforms, which ushered in a unified national system (UNS) of higher education. In the decades since, this unified system has started to disintegrate, and at the beginning of the twenty-first century a new binary model is emerging: between universities and other institutions offering higher education and higher-level vocational education qualifications. 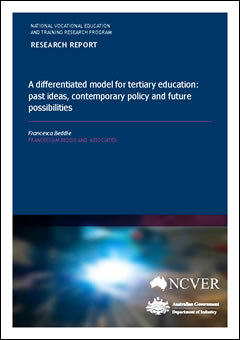 The current model of Australian higher education — basically 39 public universities — is dissolving as it faces the unrelenting push for greater productivity, the introduction of a demand-driven funding model and the emergence of new providers, both private and TAFE (technical and further education) institutes, as well as heightened discussion about contemporary occupational requirements and persistent concerns about the system’s quality. As the system evolves, we are seeing experimentation, with new approaches to undergraduate programs such as the Melbourne Curriculum,1 and new institutional arrangements across the higher education—vocational education divide. In the light of these developments it is timely to take a new look at the binary system and the lessons it might offer contemporary policy-makers. In so doing, we need to be mindful that twenty-first-century demands for skills and knowledge are different from those of the 1960s. Our deliberations offer no blueprint for further reform but do illuminate some of the persistent difficulties that confront any mass tertiary education system. Given that Australians as a whole never will separate the twin roles of universities in the preparation of professionals and the pursuit of higher learning for its own sake — and that our universities never have been able to do so themselves — sighing for the repeal of Dawkins and the reinstatement of some pure binary system is like trying to sort new from old money in Toorak or distinguish between art and erotica in the work of Bill Henson. The current reforms of higher education, their impact on the institutions and their consequences for Australia cannot be appreciated properly without placing them in their historical and social context … The institutions have a past too often forgotten, as well as a present to be criticised and a future to be remodelled. This project is framed by the recurring issues in today’s education debate. A rereading of the Martin Report (Committee on the Future of Tertiary Education in Australia 1964—65) has elicited the following themes: the purpose of education; the elusive goal of parity; the status and funding of research; the quest for autonomy in a publicly funded and regulated system; and the role of transfer from one kind of learning to another. This essay takes as its premise, as did Martin, that the success of a mass higher education system depends on sound secondary education. It also acknowledges that the questions of who pays for tertiary education and how this is achieved are pivotal. However, examination of specific funding models is beyond the scope of the project. The first part of the exercise was to revisit documents from the binary era, such as Hansard and formal inquiries, conference papers, newspaper articles and speeches, as well as oral and other histories. It also draws on earlier assessments of the binary approach. The second element of the project involved a roundtable at which senior figures in the tertiary education sector discussed, under Chatham House rules, the themes identified in this essay. The aim of the day was to canvas ideas about how to overcome some of the persistent problems encountered in mass education systems. The discussion prompted the author to sketch some future possibilities for the structure of pathways from secondary school into various strands of tertiary education (see the companion paper, What next for tertiary education? Some preliminary sketches). The intention is to stimulate debate. This essay reproduces, within the constraints of space, voices from the past to illustrate the importance of language in the implementation of policy. References in the Martin Report to lower academic capacity have led to critiques that the colleges of advanced education were intended as second-rate institutions designed to preserve the sanctity of the university as the place for pure learning and research. This project does not reach a similar conclusion about the report’s motivation: its aim was to create a new set of institutions to cater to a majority wanting vocationally oriented higher education, while maintaining a smaller group of universities producing excellent research. This was an elitist ― but still a necessary part of a system of mass tertiary education ― and something with which the system has yet to come to terms. That the colleges of advanced education became cheap alternatives to universities had multiple causes, which were not only related to policy and funding but also to traits within the sector and broader community, including institutional snobbery, professional aspirations for higher credentials and the failure to sell the idea of ‘advanced’ education to the public. The observations that emerge from this study illuminate the complex interplay of institutional structures and behaviours in the implementation of policy goals. These can be streamlined, to some extent, by clarity of purpose. However, any reorganisation of the tertiary system, as the current wave of reform has presaged, depends on a major shift in mindset. Governing education in a federation is complicated. It bumps up against politics, which can easily subvert a coherent plan. As Australia moves toward national models, the binary experiment shows the importance of finding formulae that provide equal money for equal ― not the same ― work. They must also preserve the safety mechanism the federal system offers, namely, the flexibility to cater ― ideally at the institutional level ― to local conditions and chosen expertise. This calls for regulation that coordinates the system rather than manages its institutions. We must find an agreed definition of higher education that takes account of the advanced level of skills and analytical thinking all Australians need and deserve, whether these are delivered in an applied or a more theoretical way. Beyond the definition, the system must strive to break away from institutional legacies and rivalry. This remains difficult while oversight of higher and vocational education rests with Commonwealth and state authorities respectively, especially given that TAFE institutions now deliver significant numbers of advanced (diploma and above) qualifications. That said, there will remain a demand for mid-level trade and other qualifications, as well as a vital requirement for remedial adult education and continuing professional education and development. These offerings would benefit from the inclusion of core elements (for example, a solid grounding in mathematics in the engineering occupations) to facilitate articulation to higher education. Moreover, transfer arrangements will founder without strong trust between institutions. This cannot be solely the responsibility of individuals but must be embedded in each organisation’s policy settings. An alternative structure for mass tertiary education would see a majority attend establishments devoted to adapting students to learning at the tertiary level, with this occurring in the first two years (13 and 14) after completion of the traditional 12 years of schooling. Those with a strong idea of their vocational direction would be streamed into institutions that vertically integrate broad occupational training and education, from certificates to PhDs in a certain field, for example, in health, teaching or engineering. Other Year 13 and 14 students would be prepared for progression into a research-intensive university strong in both pure and applied research, or into the later years of professional education. The latter might also be the preserve of niche institutions. Lift the reputation for applied learning by ensuring that all competency-based education embraces conceptual thinking and equips learners to move between the different institutions in the system. Decouple funding for research and teaching (including scholarly practice) and better concentrate research infrastructure monies. Introduce a single governance framework, one that fosters collaboration among governments, within the system and beyond. 1 Under this model, introduced first at the University of Melbourne in 2008, undergraduates choose from one of six degrees designed to lay the intellectual foundations for employment or further study. Most professional qualifications are offered at master’s level, catering to increasing demand in many occupations for postgraduate entry qualifications.